With Invisalign®, Smiles in Weatherford, TX, and Aledo, TX, are Looking Better and Better! You always intended to get braces, but now that you’re deep into your professional career the thought of having a mouthful of metal is less than appealing. Well, how do braces that are practically invisible sound to you? 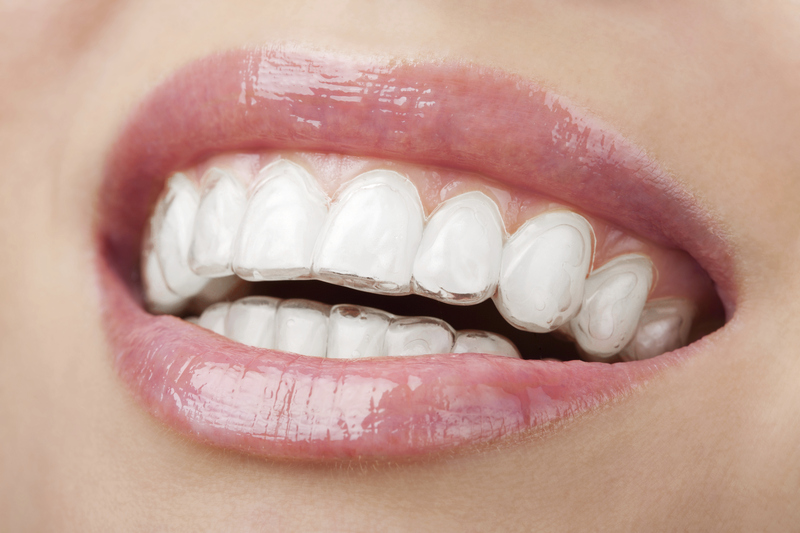 Invisalign clear braces can have you smiling during and after treatment. Dr. Deborah Romack and Dr. Garrett Mulkey of Cosmetic and Family Dentistry are building beautiful smiles with Invisalign for patients in Weatherford, TX, and Aledo, TX, as well as the surrounding area. Invisalign clear braces, or aligners, are made of clear, PBA-free plastic. At first glance, they look similar to retainers or the trays used for at-home teeth whitening. The difference, however, is in the way Invisalign aligners fit snugly over your teeth and gradually move them into their optimal position. Of course, the first move is a consultation between you and one of our dentists. Together you’ll review the goals you have in mind for your smile and determine if Invisalign is the best course of treatment. If so, then with the aid of x-rays, pictures and impressions, we’ll devise a treatment plan that will not only show you exactly how your teeth will move, but will be the blueprint that the Invisalign lab uses to fabricate your custom-designed aligners. Your job, once the Invisalign aligners arrive, is to wear each set of upper and lower braces for the better part of everyday. They can be removed to eat, brush and floss, and for a very special occasion. Approximately once every two weeks, you’ll move to the next set in the series. For most patients, the entire course of treatment takes about one year. We’ll monitor your progress through regular visits to our office. When you’ve worn the last of your Invisalign aligners, you’ll see the smile you’ve been wanting for a long time. Enjoy! If you would like to consider Invisalign clear braces, call the office of Cosmetic and Family Dentistry to schedule a consultation. We serve patients in Weatherford, TX, and Aledo, TX, as well as the nearby communities of Benbrook, Saginaw, Azle, Mineral Wells and White Settlement.